Cruisers who sail long distances typically carry a vast array of tools and spare parts, but weekend sailors tend to buy parts as needed and depend on tools normally kept at home, in the trunk of a car, or even hanging on the rack at a hardware store. But what happens when you take your boat out of home waters, with house, car, hardware store and chandlery left behind? This is a good question to ask yourself when you’re planning a vacation cruise. 5) a 3/16in slot-head screwdriver. I always keep this basic kit in a canvas roll within easy reach on my boat. As versatile as these five tools are, they are not the only ones you are likely to need during the course of even a short cruise. But while you can bring aboard all the tools you own, most of these will just add weight and take up space without proving useful. It’s better to assemble a small, select kit of tools. As a starting point, here are 10 common problems you should have the tools and parts to deal with. Whether they’re pushing a sailboat or a dinghy, all outboards can fail unexpectedly. The most common causes are contaminated fuel and fouled sparkplugs. At a minimum, you should carry spare plugs and a plug wrench, along with any tools beyond the basic five that may be required to open the carburetor bowl for cleaning. You’ll also need tools to remove the prop to replace a broken shear pin. The pliers on your boat can serve, but if you are far off in your dinghy, you will be happier if you have a dedicated pair in the dinghy’s toolkit. You also need shear pins. If your propeller has a rubber hub, a spare prop could be useful. Diesel engines can also suffer from contaminated fuel. A plugged fuel filter is particularly common on boats that have spent months at a dock or on a mooring. To change a spin-on primary filter you’ll need a strap wrench. If the filter’s manufacturer offers a special bowl wrench, buy one. This not only saves you a great deal of frustration and effort, it is the one tool that will free a tight bowl without risk of breakage. 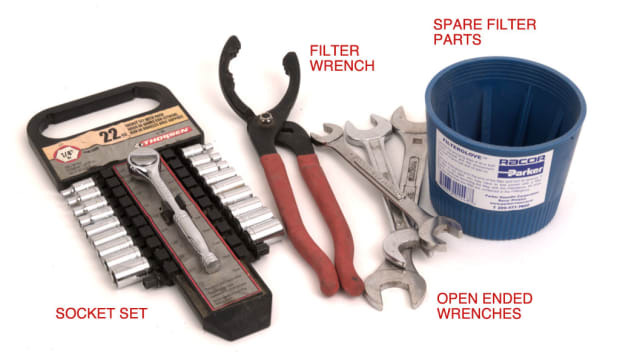 To replace the secondary filter element, you may need a special wrench or a larger gripping tool than the pliers in your basic tool kit. You’re also likely to need wrenches (most likely metric) to fit on the bleed screws on both the primary filter and on the engine. There may be room only for an open-end wrench, but where space allows, a six-point 1/4in drive socket paired with a 1/4in ratchet makes the job easier. A set of 1/4in drive sockets that includes both a ratchet and a screwdriver handle, and perhaps an extension, can be very useful. 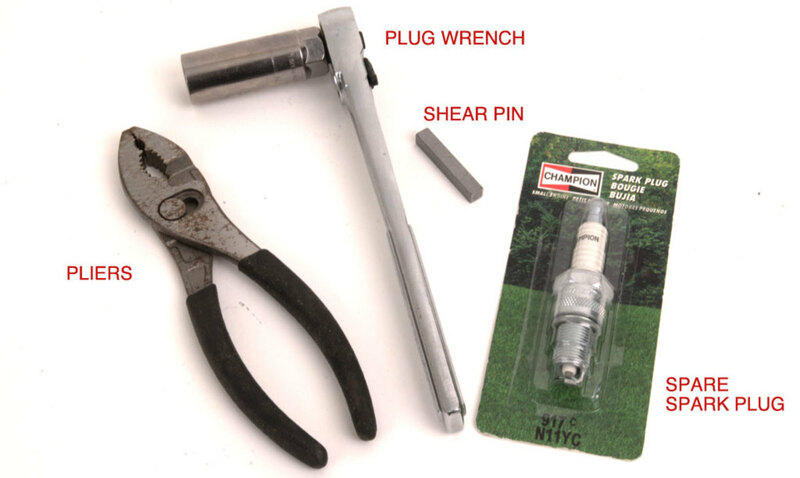 Inexpensive screwdriver bits, which fit into a 1/4in socket, convert the ratchet into a reversible offset screwdriver. Do not forget to carry replacement filter elements, at least two for your primary filter; if the first replacement also gets blocked, you will still have one available to use after you’ve cleared the tank. A plugged raw-water strainer or blocked intake can be cleared with basic tools, but you may need hex wrenches or other special tools to replace a water-pump impeller. If the problem is bearing failure, the bearings may be captured with snap rings that require special snap-ring pliers to remove and install. You should, at the very least, carry a new impeller. Replacement bearings and seals for the raw-water pump are inexpensive, occupy little space and broaden your repair capabilities. V-belt failure is another common cause of overheating, so replacement belts and the wrenches needed to install them should be aboard. A small cache of hose clamps in different sizes is also a worthy investment. Windlasses lead a hard life and often suffer for it. Fortunately, most sudden windlass failures are electrical in nature and can often be corrected with basic tools and a brass wire brush or a bit of 400-grit wet-or-dry sandpaper. Dielectric grease or spray-on corrosion inhibitor will protect revived connections. If there’s corrosion inside the cable lug, replacement lugs will be handy, but only if you also have the tools needed to cut the cable and crimp on a new lug. If the windlass is protected by a fuse rather than a breaker, a spare fuse is essential. In the event of a fatal mechanical or electrical failure, attaching the chain hook on your snubber to a long line will allow you raise your ground tackle using a sheet or halyard winch. If you do not have a snubber (you should! ), add a chain hook to your tool inventory. 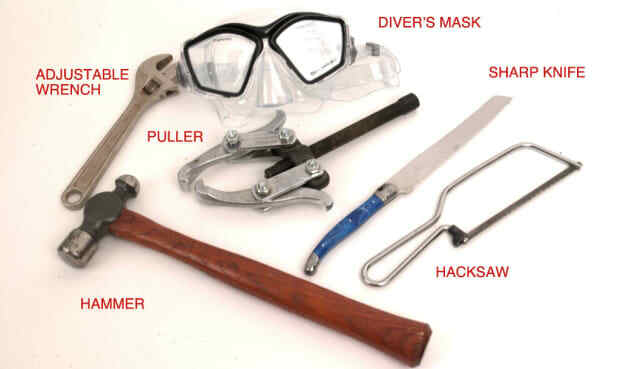 A sharp knife and a dive mask are usually sufficient to clear a wrapped prop. The serrated edge of a hacksaw blade can be better for clearing a particularly tight wrap or one involving wire or cable. (A hacksaw also has lots of other uses aboard.) If your prop is damaged, having a spare aboard will be of little use unless you also have a prop puller. Most pullers require the leverage of a long wrench—a 10in or 12in adjustable wrench is a good choice—and perhaps the persuasion of a hammer blow. A ball-peen hammer is a better boat tool than a common claw hammer. Increased propshaft revolutions during a vacation cruise can cause your stuffing box to drip a lot more. This is not likely to be dangerous, but it can be disconcerting to hear the bilge pump cycling throughout the night. You should carry the tools needed to tighten the box. There are a number of special tools available, but in most cases, the best choice is a pair of small adjustable pipe wrenches. As with the windlass, other onboard electrical failures are likely to stem from a loose or corroded connection. The most useful tool for pinpointing such problems is a basic (read: inexpensive) digital multimeter.A length of 12 AWG wire (big enough for most purposes), a handful of crimp terminals, and a selection of spare fuses will likely be sufficient. You’ll also need a wire stripper, a crimping tool and a roll of electrical tape. I have never seen a marine toilet that could be worked on in place without some special tool—an extra long or an extra short screwdriver (or both) and maybe an offset wrench. 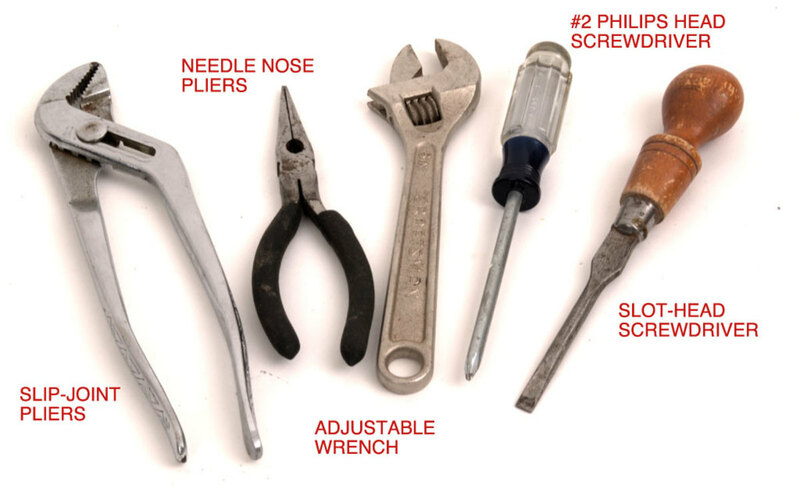 The best time to determine what tools are required to reach the various fasteners is before you need them. With the common exception of an exhausted joker (duckbill) valve, most manual toilet failures can be corrected without replacing parts, but it is prudent to carry a complete service kit. Those with tiller-steered boats can skip this one, but if you have pedestal steering, you would be wise to have a set of spare cables aboard. You should also worm your way into the back end of the boat to see what tools you need to release the old cable and install a new one, and to adjust the tension. Make sure you have these aboard. At the pedestal end the cables attach to the drive chain with clevis pins that can be dismantled with your basic tools, but you may have to remove the binnacle to gain access. Check these screws to be sure you have the right tool to release them. A torn sail need not ruin a cruise if you have a fresh roll of sail-repair tape aboard. 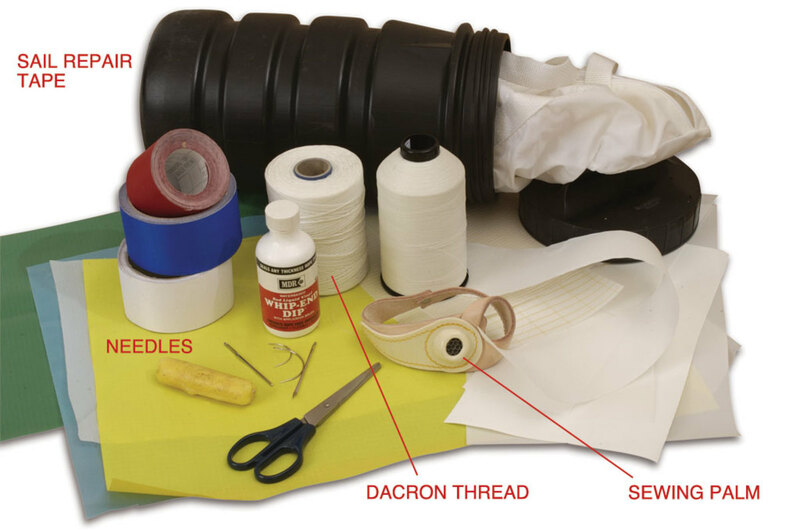 To make more permanent sail repairs, you’ll need a few needles, a small cone of Dacron thread and a leather sewing palm. These are far from the only breakdowns that can occur while cruising, but this should illustrate that only a few specific tools and spares are required to perform most repairs. A 17-piece wrench set or a full complement of 1/2in drive sockets are likely to be nothing more than expensive ballast aboard most coastal cruising boats. Carry only those tools that fit the fasteners that hold the various bits of your boat together and you will have what you need and won’t be burdened by what you don’t.